Biography Synopsis: Research in Memphis City Directories turns up a bit of information on Rev. Campbell but also raises some questions. Nevertheless, the portrait that emerges is consistent with the picture painted .. of a small­time preacher, possibly of the “jack leg” type (i.e. without a regular congregation), who got a lucky break in recording for a major record company and had a brief period of fame before fading back into obscurity. No one named E. D. Campbell shows up in the years through 1926, suggesting that our man may have moved to Memphis, perhaps from the surrounding countryside, shortly before he first recorded or even that he was still living outside the city. Our Reverend also fails to turn up in the 1927 and 1928 City Directories. A further possibility might be that he went to Chicago following his initial recording success, for we find him in a Victor studio there in November of 1927 with a new congregation, a piano to accompany the singing, and generally more modern songs. (During a break in this session, one track was recorded by Paul Whiteman’s Rhythm Boys, including Bing Crosby, and one wonders what the two aggregations thought of each other as they crossed paths in the studio.) … It would appear that his formal preaching career lasted only a few years and may have been a reflex of his brief burst of success as a recording artist. Born: 1876 / 1880 / 1882 / 1885 / 1888? Biography Synopsis: Rev. Edward W. Clayborn billed himself as “the Guitar Evangelist,” and indeed he was, singing a kind of blues gospel not unlike the work of the better known Blind Willie Johnson. 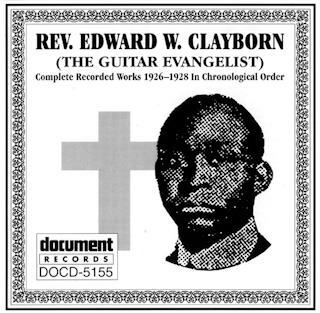 A brilliant guitarist and slide player, Clayborn recorded some 40 tracks for Vocalion Records between 1926 and 1930. 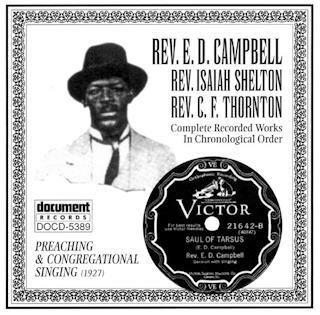 Most popular song(s): “Your Enemy Can’t Harm You (But Watch Your Close Friend)” and “The Gospel Train Is Coming” – both helped put Vocalion on the map as a serious contender in the Race records market and helped to ensure further recording sessions for Clayborn. Biography Synopsis: Formed as a quintet in 1913 with the intent to sing only in their local church, they travelled extensively in the United States, Canada and Europe. They were also exceptional in that they sang with instrumental accompaniment during their early years. Recording career: 1913 – 1948? “One of the great gospel recordings of yesteryear is “Memphis Flu” by Elder Curry. Recorded in 1930 the lyric describes that the influenza epidemic that spread through Memphis in the years following the First World War. 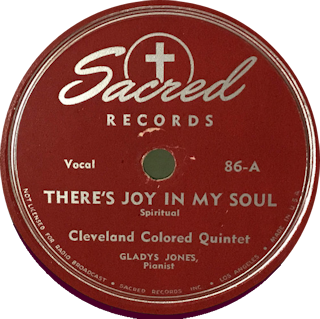 The track is propelled by Elder Charles Beck’s stomping eight-to-the-bar piano and Elder Curry’s melodic guitar playing while Jo Ann Williams powers through the lead vocal while a raucous congregation urged her on. As the [Document Records] sleevenote rightly acknowledges, “The performance possessed an indescribable ebullience that surely must have prepared the way for the descent of the Holy Spirit.” None of the seven other Curry sides here quite reached that same atmosphere though the powerful denouncement of illicit alcohol, “Drinking Shine”, comes close”. “Biographically, little is known of these performers. According to Gayle Dean Wardlow’s note to Origin LP OJL-13 (where “Memphis Flu” was first reissued in 1966), Elder Curry was “a preacher and elder in the Church of God in Christ since 1915” and had “active churches in both Morton and Jackson, Miss. (1965)”. In the same notes Wardlow stated that Elder Charles Beck was considered by Curry to be the best sanctified player in Mississippi and was a member of Curry’s church before relocating to Memphis, Chicago, and Africa, where he was a missionary at the time those notes were written. Additional information was collated by Ray Funk in 1991 for Columbia CK 46779. In those notes, Funk reports that Beck was ordained a minister in the Church of God in Christ by Bishop Mason himself (who founded the sect in 1895 in Memphis), and was an important itinerant minister for them with congregations in Buffalo, Jacksonville, and Pittsburgh. 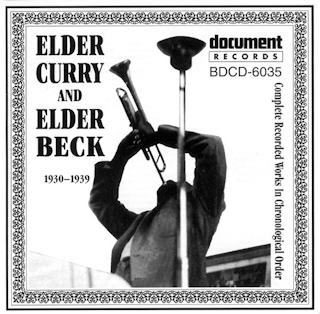 In postwar years, Beck recorded for Eagle, King, Deluxe, Gotham, Chess, Chart, and Folkways in a number of varying styles. Charles Beck died in 1966, survived by several children who continue his legacy in both the R & B and gospel fields”. Musical Influences: Claims to being the first rock & roll record ever made.